The best part is you already have the 5 ingredients. I was inspired to create this list because of my daughter Gigi’s artwork. I realized the objects she used in her masterpiece on kindness could be metaphorical for grown-ups. Take a look around. Do you have a book that you loved reading? Instead of keeping it on the bookshelf collecting dust, why not give it to someone? Maybe this book will bless them in ways you can’t imagine. A fellow actress, who’s often up for the same roles I am, gave me a book out of the clear blue one day. It brought me so much joy! Every time I think of that book I smile. But even more so, I smile remembering her act of kindness. Write down all the reasons you love someone. Give them the list. Why not write down all the reasons you love yourself while you’re at it? Leave a note in your child’s lunch bag or backpack. I think in our digital world we sometimes forget a simple #2 pencil can be transformative. Imagine painting the world with what lights you up! No longer covering what makes you special or what brings you joy because of the fear of judgment. How would that change your life? I remember hearing Dr. Wayne Dyer once say, “What you think of me is none of my business.” Start painting the world with your light. Relationships suffer over time if the connection gets weak. The glue connecting you may need refreshing. I recently saw two college friends I hadn’t seen in 20 years. I was given 24 hours’ notice to make it happen and I did. It felt marvelous! Who can you reconnect with right now? Tell me what doesn’t improve with a bit of sparkle? Your laughter may be exactly what someone needs to hear today. With a child’s perspective, you can be kind in very simple ways. 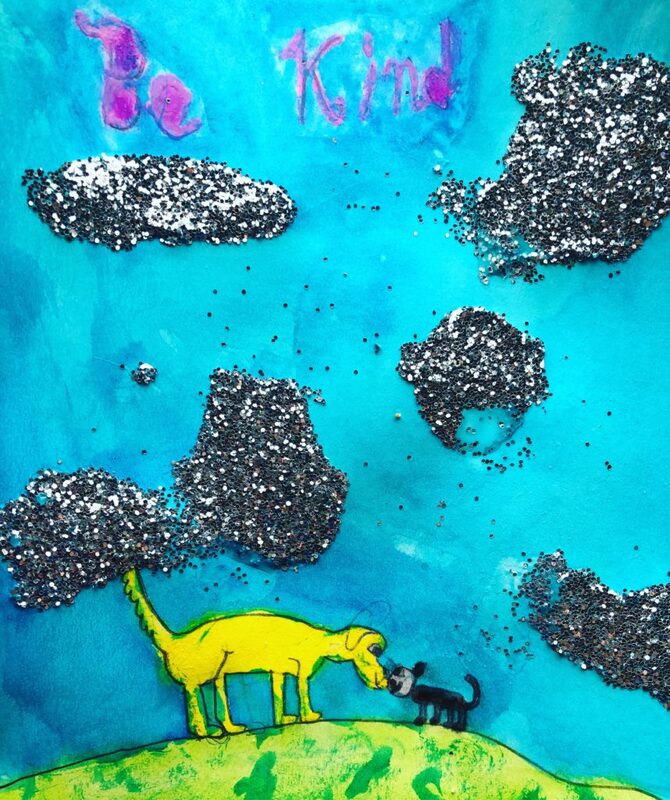 Like the golden retriever and black cat in Gigi’s artwork, you can be very different and still find a way to get along. Kindness connects us. Let’s keep it simple to simply be kind, okay?